The colors of the flowers stand out even more with this immaculate white! This planter idea can be adapted in any way you like. Change the color, or add decorations. But the idea is excellent ! 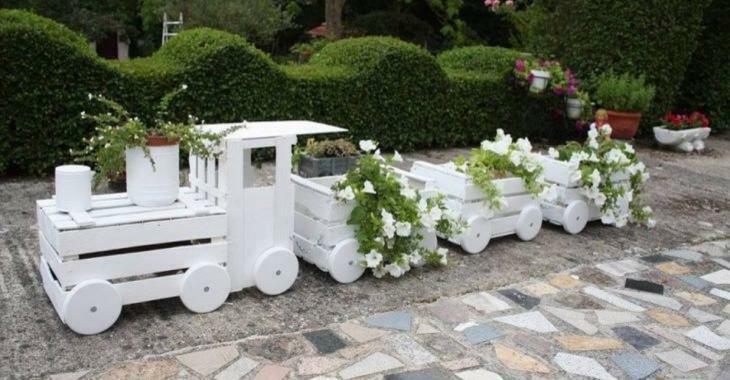 Add flower pots to the chimneys of the locomotive and the wagons of the train... It's charming and all your neighbors will compliment you on your creation. A very nice project to work on over the winter in your garage ! It will be ready for spring ! 1) Start by picking up recycled wooden crates or picking up new ones from DIY stores, or from department stores. 2) Collect wooden washers (rings) or cut them out of wooden planks. 3) Apply a coat of primer all over the wooden washers, on the wooden creates, on the tin can and the flowerpot. 4) Once the primer is dry, apply the number of layers of white paint needed for the white to be opaque. 5) Once the paint is dry, apply one or two coats of exterior acrylic to protect the paint. 6) Attach the wheels to the locomotive and wagons, flowerpot and tin can on the locomotive. 7) Then connect the boxes to each other with chains and eyelet screws. 8) Attach the boards cut to the correct size on the roof of the locomotive. 9) Then add the flower pots, with the flowers added in the pots, at the bottom of the crates. Have you ever done something similar ? If so, share the pictures of your projects with us in the comments section ! If you enjoyed this project, let your friends also enjoy this awesome article by sharing it on your Facebook timeline.